As we have reported, tomorrow is the Midland Greco-Roman Exhibition Series, a special event being held in conjunction with the 2017 Lady Warrior Open on the campus of Midland University in Fremont, Nebraska. Some 90 bouts are on the card headlined by 2012 Junior World bronze medalist/2016 Olympian Jesse Thielke (LOG), who will be up at 67 kilograms and is currently scheduled for a whopping seven matches. Along with Thielke and Legends of Gold teammate Cody Pack (77 kg) are many of the country’s top rising prospects and established age-group competitors, making this a truly unique set of circumstances as well as an exciting new way to promote the sport of Greco-Roman. But there is another variable involved that adds just as much intrigue. Tomorrow, ordered par terre is going to be a part of the proceedings for all age levels. 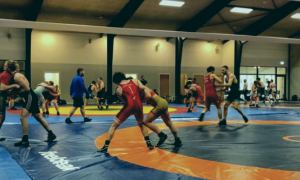 Greco athletes, coaches, and fans have known that forced par terre was due to return to the curriculum eventually, especially since United World Wrestling President Nenad Lalovic said so during a press conference at the Paris Worlds in August. What had yet to be fully determined (and is apparently still somewhat in question) is how it is going to be applied. Even with that, Midland event organizer Cody Goessl, a UWW category 2 official, decided to give par terre a try tomorrow. With him on the officiating crew is Danny Blackshear, one of the most respected and longest-tenured officials in the sport. Goessl worked with Blackshear and went through the officiating chain of command in order to get the green light to unveil what will be an attempt at interpreting what the updated rule-set may offer. Again, it is important to note that tomorrow’s version of par terre is subject to change and also, it will (likely) be the first and last time you see it before 2018. To put it plainly, these procedures are tentative and may be amended before widespread implementation next year. Par terre positioning — The defensive wrestler will start with his (or her) belly flat to the ground. The offensive wrestler will be to the side with both knees down without straddling one leg of the defensive/bottom wrestler. Wrestling will commence once the offensive wrestler touches both hands to the back. Passivity — Passivity is still, of course, the determining factor, but how it will be called may differ when it is officially locked down in the rulebook. For the purposes of tomorrow’s rule testing it will work like this: most likely, there will be two passivities per match. If there is no scoring, the first passivity will be called with one minute left in the first period. The second passivity will be called at or around the 1:30 mark of the second period. Both passivities can be called on the same wrestler. Prior to par terre, the top/offensive wrestler will receive one point (plus his chance to score from par terre). Negative wrestling — Defined as head down, hips away, blocking with a wrist tie, not advancing into body position (i.e., underhooks, snap downs, etc.) will result in the offending wrestler being called for passivity. One point will be awarded to the other wrestler and the action will then move into par terre. Cautions — “Caution and one” may not have the same ring to it as “caution and two”, but that’s where we are. 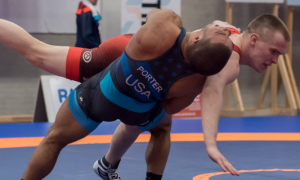 The Midland Greco-Roman Series serving as a testing ground for par terre could prove very important in the US. 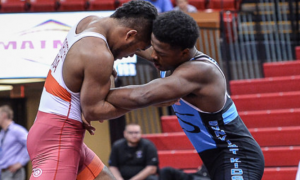 Wrestlers and coaches will now have the opportunity to witness its influence and dynamics, and take that information back to their training environments and apply it before the rule change goes global next year. It is also an excellent mechanism to open up dialogue between coaches and officials, which adds to the transparency most desire pertaining to Greco-Roman officiating. Fans who live nearby or within reasonable driving distance from Midland University can attend tomorrow’s event — $3 for kids, $5 for adults. Remember, in addition to the dozens and dozens of Greco-Roman matches is a women’s freestyle tournament, so if you’d like to catch a whole lot of high-level wrestling going on under one roof, you’re guaranteed to get your money’s worth. If you prefer to check out what is going on via the internet, both MWC and Combat Wrestling Club will be offering live streams of the Greco contests via Facebook. For a full list of tomorrow’s bouts, swing on over to here. The Complete USA Roster for THOR MASTERS 2019!